Marie starts off her column with a bang. Arguably the best horror film ever made; William Friedkin’s The Excorcist. The Exorcist – or The Film I Swore I Would Never Watch, Not Ever In My Lifetime, Never Ever. The Exorcist … can you hear this picture??? I did it. This scaredy cat cinephile challenged herself and watched the film she’d been told was the scariest film in existence. Why? Because I decided that avoiding films just isn’t the thing a true movie fan should do. How? Broad daylight, a remote control by my side, and some sewing to multi-task with. 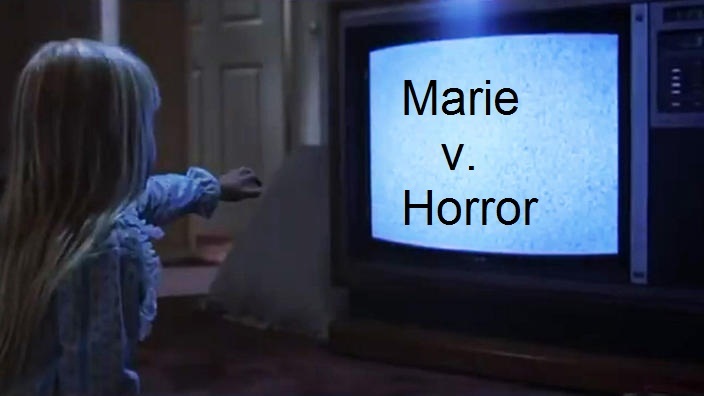 If you read my recent introduction to my aversion for horror films, you’ll have learned that among the things I dislike are jump scares, people speaking in strange voices, and weird eyes. I’m not saying it was an easy watch. The burning question then – was it worth it? Did I like the film? Well, it obviously looks a little dated now. But it’s very easy to see how in 1973 this was a game changer. 45 years ago audiences would never have encountered anything like this on screen before. The subject matter, particularly featuring a lovely young girl turning into a foul-mouthed creature railing against the church, was very controversial. Perhaps it still is, but society has changed and we view some things differently now. And while I could never say that I enjoyed the film (because this is not the kind of film I enjoy), I can certainly admit that it is justified in being regarded as one of the great horror films of all time. I’m glad I’ve seen it. Afterwards, I was giving some thought as to why The Exorcist was not as frightening to me in the end as I had anticipated. Part of it is familiarity; a strange thought, given that it was my first viewing. But despite not having seen the entire film before, it’s become so well-parodied and imitated that I felt like I had seen parts of it already. I kind of knew when to look away, or when to be ready for something jumpy. I also found a healthy amount of eye-rolling to be helpful. I was brought up in the Catholic religion and found myself laughing inwardly at the holy praying and imploring. I can totally accept that if the viewer is religious, or has a belief in spirits – good and evil, angels and demons – then The Exorcist will be both thought-provoking and potentially terrifying. Me? I was with the scientists looking for a medical or psychological reason for the behavior. Laughter is often a way of dealing with unpleasantness or distress, and this was often my response while watching The Exorcist. (In a similar vein, I guffawed at several points during Darren Aronofsky’s Black Swan too). You may say it’s not the correct way to react to horror films. I would counter that there is no correct way. It hits you however it hits you and if some gallows humor helps, then so be it. But then, The Exorcist isn’t actually about exorcism, is it? It’s about something much more real. And that’s what makes it good.